The message to participants in Sunday’s Prevent the Cancer Walk/Run 5K was simple: get healthy and get tested. According to the American Cancer Society, Cancer is the second most common cause of death in the U.S. More than 1.6 million people will be diagnosed with cancer and approximately 500,000 will die from cancer in 2013. Further, the World Health Organization estimates that nearly one-third (30 percent) of all cancer cases can be attributed to unhealthy lifestyle choices such as tobacco use, poor diet, and physical inactivity. The Prevent Cancer Foundation’s 5th annual untimed 5k convened runners of all abilities to engage in physical activity and learn about strategies for reducing the risk of developing cancer. 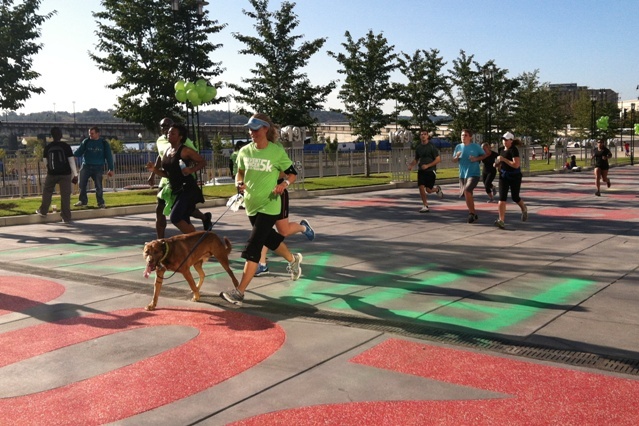 Starting and ending at Nationals Park in Washington, D.C., the course followed the Anacostia Riverwalk Trail with views of the Southwest waterfront and U.S. Capitol in the distance. After the race, runners were invited to take pictures with the Nationals’ president mascots and practice their swings in the team’s official batting cages. Participants were also encouraged to view several booths around the park featuring free health screenings and procedures including blood pressure tests, skin cancer assessments, and flu vaccinations. Wood estimated that nearly 150 teams from around the area participated in the fun run and walk, making this year’s event the biggest yet. Participants contributed more than $140,000, which will support the Foundation’s research, education, community outreach, and patient advocacy activities. Teams consisted of businesses, families, and groups of friends – all running to commemorate someone close to them affected by cancer. David Barmore and Zach Olson of Washington, D.C. joined colleagues from the Podesta Group to raise money and support cancer prevention awareness. “It was fun to get up early on a Sunday and do something healthy for a good cause,” said Barmore. He also ran for his late grandfather who passed away from cancer. Olson was joined by his four-month pregnant wife, Emily, who completed the entire 3.1 kilometers with ease. Emily expressed the importance of maintaining a healthy weight and credited her success in the fun run to frequent swimming and jogging sessions. Katie and Ryan Connolly and their three kids Addyson, Haydin, and Emma of Vienna, sported “Cancer Conquers” tees during the race. The family stuck together on course, running as part of Prevent Cancer 5K Chair Allison Hutchins’ team, and said they were looking forward to getting out on the Nationals’ field for batting practice. George Washington University students and members of Alpha Phi Omega, a co-ed service-driven fraternity, Beth Stradder, Jen Muething and Patton Linder, encouraged six peers to run the race as a way to raise money for cancer research and prevention. Each student ran for someone they know who has been diagnosed with cancer. “It’s a cause that’s really important to us since we all know someone who has been affected by it,” Stradder said. The group will also organize a team for the American Cancer Society’s annual Relay for Life to raise money in the fight against cancer. Other runners credited the event as a motivator to get in shape. Lauren Phillips of Washington, D.C. said she gained weight after graduating from high school and recently developed a stringent exercise and diet routine to shed the extra pounds. Phillips signed up for the race with friend Daenia Peart, also of D.C., as a reminder to keep up with daily runs. To learn more about the Prevent Cancer Foundation and for more information about cancer prevention, visit: http://preventcancer.org/.